Michael Zuckert is the Nancy R. Dreux Professor of Political Science. He works in the two fields of Political Theory and Constitutional Studies, in both of which he has published extensively. He has published Natural Rights and the New Republicanism, the Natural Rights Republic, Launching Liberalism, and (with Catherine Zuckert) The Truth About Leo Strauss in addition to many articles. He has also edited (with Derek Webb) The Antifederal Writings of the Melancton Smith Circle. He has a book Leo Strauss and the Problem of Political Philosophy (with Catherine Zuckert, University of Chicago Press) and is completing Natural rights and the New Constitutionalism, a study of American constitutionalism in theoretical context. 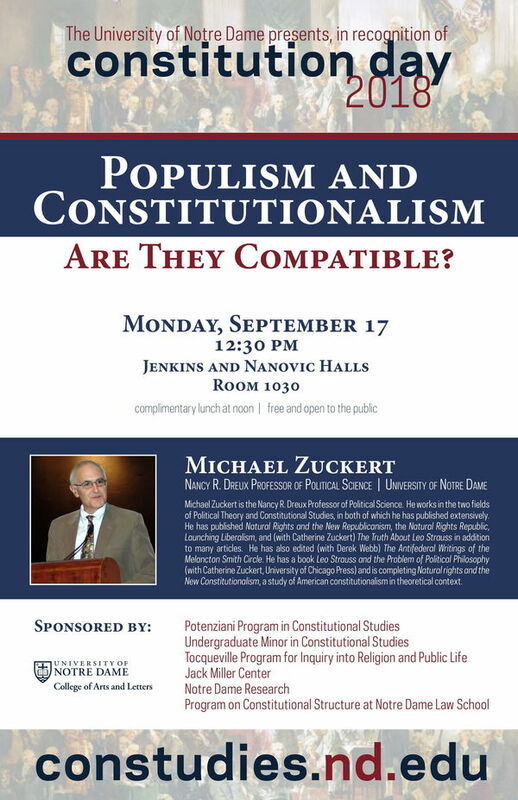 The 2018 Constitution Day lecture is presented by the Potenziani Program in Constitutional Studies, the Undergraduate Minor in Constitutional Studies, the Tocqueville Program for Inquiry into Religion and Public Life, the Jack Miller Center Notre Dame Research, and the Program on Constitutional Structure at Notre Dame Law School.